Holly becomes a mum with her first litter! The next step of our journey was to get our own affix, as we wanted to let Tess have a litter. Choosing an affix was not easy our first six attempts were all rejected by the Kenel Club because they were quite close to existing names. It became clear that we had to get more creative than trying to make combinations out of our names! Thinking about a Scottish connection we decided to explore a name that would have a more ancient and distinctive character and ended up spending hours on-line using a Gaelic to English dictionary. Finally we found a connection - the Gaelic words for true and loyal (fior) and friend (cara) fitted together to make Fiorcara, meaning true and loyal friend - a perfect description for this loyal and distinctive pastoral breed. Unfortunately, our first attempt at having a litter was not a success. When Tess next came in to season she was mated, but despite our best efforts there was no resulting litter. Although this was a dissapointment, we realised that, this time, it was not meant to be. Our next opportunity for having a litter was when Holly came in to season. 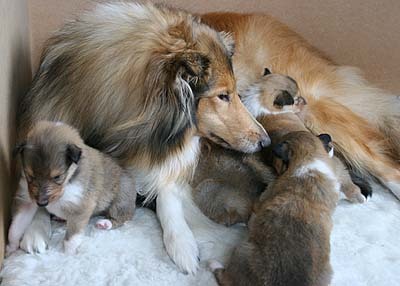 Our aims are to breed to the standard, looking for what we consider to be the traditional type of rough collie - sound construction, even temperament and of the correct size and shape - atributes which seem to be less and less in fashion in the so called modern collie. Because of our preference for an old fashioned type of rough, selection of the right stud dog was paramount. So a mating with Ladnar Doctor Pepper was chosen. Resulting from this mating Holly gave birth to a litter of pups 60 days later on May 24th, 2007. 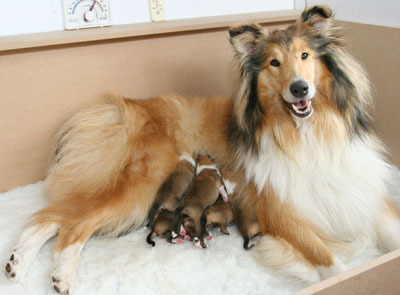 This was Holly’s first litter of pups and she proved to be an excellent and devoted mother. More details are on our litter page. Over the following eight weeks we learned all about raising pups and started to think about finding homes for this litter of eight tykes! To our suprise we had an astounding number of enquiries and were pleased to find some special people who were looking for a puppy. have a look at our “Away From Home” page to find out where they are and to see some pictures. Thinking about the pups going to their new homes, we decided to create an information resource called an owners guide. A simple idea that finished some 8 weeks and 43 pages later as we created a guide to owning a rough collie to give to each of the new owners. The guide is our attempt to put all the information we learned and needed when raising a new 8 week old pup, in to one place. 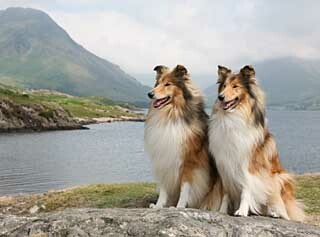 The Owners Guide is now on line and available here in the hope that it will benefit many other rough collie owners. In their element Holly and Tess against the backdrop of the majestic Lake District. In the whelping box! Holly settles down with her one day old litter of shaded sable and white pups! At three weeks old the pups are looking decidedly bigger! At six weeks old, waiting for breakfast! At eight weeks old the pups no longer fit in the whelping box!